When you are cuddled up on the couch having a snuggle session with your cat, he or she is feeling safe, warm, comfortable, and loved. Your cat may express his or her pleasure with the happy purr. This sound can also happen spontaneously when you run the can opener or dangle that favorite stuffed mouse on a string. Happy purring is the most common occurrence of the purr and takes place when your cat sends a signal from its brain, activating sensory nerves within his or her voice box. The vocal cords vibrate as the diaphragm pushes air rhythmically through the vocal cords, causing the happy humming sound. But just because your cat is purring as you load him or her up in the pet carrier for a trip to the vet, doesn't mean he or she is overjoyed to be getting annual vaccinations. The purr of a cat has also been found by animal behaviorists to be a kind of calming technique used in stressful situations. This can be compared to whistling as you walk down a dark alley, or chanting “Ohmmmm,” while sitting in the lotus position. The vibrations of the purr can be an attempt to relax or focus on a less-stressful stimulus. Cats will also purr when they have been severely injured, are recovering from an injury, while birthing a litter of kittens, and sometimes when they are near death. However, there have been some incredibly interesting scientific findings that could explain this phenomenon, aside from the relaxing and meditative benefits of the purr. The sound frequency of a cat’s purr falls between 25 and 150 Hertz. What does this mean? According to Scientific American, “Various investigators have shown that sound frequencies in this range can improve bone density and promote healing.” Scientists believe that this is one reason that cats are so physically resilient and heal broken bones quickly (prompting the “nine lives” myth). 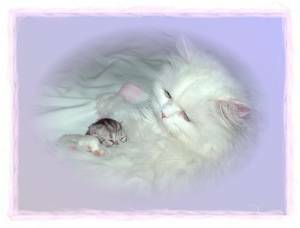 Momma kitties, when birthing, will sometimes purr, probably to relieve their anxiety or focusing on something other than the inevitable pain of labor. However, once the labor is done and the kittens are cleaned up and nursing nicely, Momma Cat will continue to purr. This doesn’t just signify relief that the situation is over, but reassures her new little guys and gals that everything is okay. Kittens won’t open their eyes for a couple of weeks, or even meow right away, but they can purr by the time they are two days old. This method of communication lets their mother know that they, too, are okay. Unlike other cat noises such as hissing or meowing, the purr actually serves as a defense mechanism, coping method, communication technique, and even part of the healing process. The scientifically-proven benefits of the purr could also explain why bedridden patients and seniors in nursing facilities profit so much from feline companionship: that cat on their lap is literally giving off good vibrations. 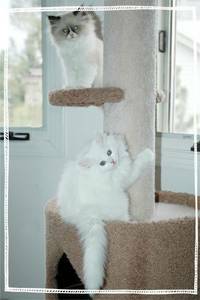 visit our Health Benefits of Cat Ownership page!